it was a great weekend, to having a freeroll is an excellent decision, i saw few aunty supposed to try the freeroll only, and they join the main event afterward! my girl friend who supposed don't join tournament, but after she tried the freeroll, she want to take part in the next main event!! i think to have a freeroll for every month on board is a must! can attract more players to come, not to say all joining for main event, but they might probably play cash game, play side event and SNG. just my quick feedback, FREEROLL! freeroll bring more new players! yup.. freeroll could bring more new comer on board in poker game..
freeroll also could let someone build their bankroll for mainevent buy~in..
haha since some many ppl like to play freeroll why dont jus play freeroll online? instead of making pack on board? y LW not organise their own poker web site? yes, totally agreed, if freeroll is still on, then im confident that i can bring more friend on board. 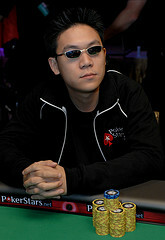 tikipost wrote: yes, totally agreed, if freeroll is still on, then im confident that i can bring more friend on board. A special thank you to all the kakis that have been supporting the LWPS. The dates for January are on 22nd and 23rd. Details on the event schedule will be posted soon. An alternative would be to find someone who is playing table games with normal chips and ask if you can change with them. Seriously though, it's not hard to roll 300 dollars even by yourself. Playing basic strategy blackjack brings down the house commission to about 2% tops. If you even intend to play casually in the table games, I would even suggest you roll for the room. At $2500 house chips change for a free cabin, it's pretty much a no brainer. You're basically going to be playing on close to even odds with the house for the $2500, and that's as good as it gets when you're at the table. hopefully the date remain unchanged la, cos i already apply leaves! u r my man! take leave to attend LWPT? wish u tons of luck..
Oh i just realized i have already booked for the Macau one.